The Gospel of John is an account of Jesus like no other, unveiling for us Jesus’ Divinity; the One Who came to us directly from heaven and the love of the Father. His Gospel is all about the Son of God. Notice the definite article, “THE,” in parentheses. In the original Greek, it simply says, “En arche: In beginning;” no “The.” This definite article gives the impression that somewhere in the beginning, Jesus started to exist. That would be inaccurate. He always existed together with the Father. There are many reasons John is SO different from the other three. Matthew, Mark, and Luke, known as the “Synoptic gospels,” because they are seen together. Syn meaning, “Together;” Optic meaning, “To see.” They parallel each other in many ways, though there are things unique to each. Not so the Gospel of John. It is in a class all by itself. This Jewish secretary was the youngest of the disciples and the one who leaned on Jesus’ breast. He penned his Gospel as well as 1st, 2nd, & 3rd John plus the book of Revelation long after the the other three wrote theirs. Because he wrote so much later, he had the benefit of all Paul’s writings and teachings, unlike the others who didn’t meet Paul until much later. As a result, John understood the Grace of God. This is why you don’t find the phrase, “God so loved the world,” anywhere else. He understood that the Gospel was for the whole world. The miracles in John’s gospel are called not called, “Miracles; he called them, “Signs.” Yes, they are real miracles that Jesus actually performed, but they also “Signify” deeper spiritual truths and have prophetic significance. God has singled out the seven “signs” in John to teach us spiritual truths and show us things that would happen in the last days. The bosom, or breast, is where love resides. Notice the present tense of the word, “IS.” The reason Jesus lived such a victorious life on earth and was able to do so many miracles was His unceasing awareness of the Father’s love for Him. He didn’t come FROM the bosom of the Father, as if He left that place to come to earth. He IS always living there! As you read in earlier parts of this series, each Gospel has some account that is found nowhere else. But the first three, parallel each other. Often you will find similar accounts of the same story with important differences for Divine purposes. 95% of the stories and accounts found in John are not anywhere else. Mark, however, is just the opposite. 95% of his gospel is found in the other synoptic gospels. Only 5% is unique to Mark. If John had not written his account of Jesus, there are many things we would never have known. In Chapter 1, for instance, he told us that “The word became flesh and dwelt among us.” In Chapter 2, Jesus turned the water to wine. That isn’t mentioned in the other gospels. In Chapter 3 we have the story of Nicodemus. Chapter 4 is the story of the woman at the well. Chapter 5 is the account of the pool of Bethesda. Chapter 6 is details the woman caught in adultery. Chapter 7 is all about the amazing story of Lazarus being raised from the dead. Every single one of these accounts is peculiar to John. The first miracle Jesus ever performed, where He turned water into wine demonstrates that He is Lord of time. When you want to make wine and you start from scratch, it takes several years for the seedlings to mature to the point where the grapes are suitable for making wine. Even then, once the vines have produced fruit, you must wait another 3-4 more years until they are mature enough to make wine. The longer you wait, of course, the better the quality of your grapes. After they have matured and you have made your wine, the longer it ferments, the better the quality of your wine. The longer you keep it, the quality improves: 20, 30, even 50 years later. And yet, in an instant, Jesus compressed time and the water in the 6 jars became the BEST WINE! AWESOME! This miracle of turning the water into wine is a sign to Israel that the days of continual cleansing for purification, of washing their hands and feet, are over. Jesus turning that water into wine indicates the times of celebration have come. The days of the Law and constant cleansing are over! Every sin has been removed by the precious blood of the Holy Lamb of God! We have now been made the righteousness of God In Christ!! As you saw, Jesus didn’t only turn water int wi: He turned it into the BEST wine. The governor of the feast told the bridegroom that he saved the best wine until last. This was very unusual! Normally, the best was served first and the cheap stuff saved for the end, when people are too drunk to notice. Jesus, THE BRIDEGROOM, has saved the best WINE for last; for us: The end-time generation! Only in John do we have the teachings in the upper room. What is recorded there is the message for the Church. This is the only place where we find the High Priestly prayer of our Lord Jesus. In that upper room, He told them as much as He possibly could. There were many things, though, that they would understand later, after the Holy Spirit was sent. One thing they didn’t understand was what He was demonstrating by washing their feet. John is the only one who told us about certain events that transpired in the Garden of Gethsemane. When they answered Him, Jesus responded with one word: “Anoki: I AM,” the Name He revealed to Moses at the burning bush. At the mention of His Name, these big, burly, strong soldiers fell flat on the ground before Him! They were pinned to the ground until He let them go. No other gospel tells us that! No other gospel mentions that Jesus was bound. Why is it recorded only here? Because this is the gospel all about the Love of God and of His beloved Son. The first mention of someone being bound in the Bible is in Genesis 22: “Abraham bound Isaac.” Any time a subject or word is written or talked about in scripture for the first time, there are lessons to learn and wonderful truths hidden for us to find. Isaac was Abraham’s “Beloved son; his only son.” He is a picture of Jesus, God’s beloved Son, His only Son, who would give His life for the whole world one day. 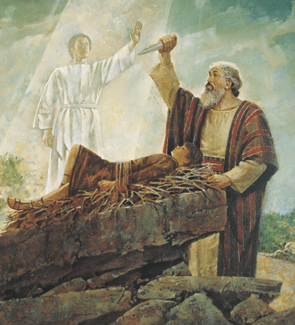 It was a sign to Israel that Jesus is the true Isaac. NO ONE can bind Jesus unless He allows it. Remember what happened when all He did was say His Name? That’s why all those temple soldiers fell and were pinned to the ground! They were unable to get up until He allowed it. He allowed Himself to be arrested. Notice there was no falling down when He said His Name this time. Jesus, not the soldiers, was in complete control of the “Arrest” in the Garden. What a Savior! What a hero the way He protected His people! At His word, the soldiers let everyone else go. The Gospel of John is the only one that tells us the following information about how Jesus died. Many people were crucified at hands of the Romans in those days. It was the most painful and humiliating form of execution. Though this ignominious form of death did not originate with them, they certainly “perfected” it. Archaeologists tell us that victims of crucifixion, in their attempt to gasp for air, often cracked the back of their own skulls. Their necks were all bent back at a severe angle in their struggle to breathe. In a matter of a few hours, the victims died horribly, slowly, of asphyxiation as their lungs collapsed. It’s the most awful way to die. Jesus, however, in stark contrast, did exactly the opposite. Yes, He was in extreme pain from all the physical abuse He had undergone; but He did not die from His wounds. Remember: No one can take His life. He laid it down of His own accord. In demonstration of His glory, majesty and complete control, he bowed His head….FORWARD….dismissed His spirit, and breathed His last. The Greek word for “gave up” in this verse is the word, “Paradidómi.” It means, “to hand over deliver, commit, commend.” Jesus didn’t helplessly lose his life, overcome by the pain and the suffering He endured. His spirit could not leave without His consent. He purposefully committed His spirit into the hands of His Father, after He spoke His last word, “Finished.” The price was paid. Our redemption was complete. All judgment was satisfied to the fullest extent of the law. Jesus, at last, had found a place to rest His head. He found His rest in saving us; in loving us, when He bowed His head and dismissed His spirit. He could not have died if He did not send His spirit away because one cannot die in the presence of God. Oh how He loves you and me! What a God! What a Savior! I am so glad John wrote these wonderful chapters about Jesus and His love for us! Please follow the link below to part 8. We’re going to talk about the beauty and amazing symmetry of the Gospels. To always SEE what John saw!!! Soon, we will actually be able to do that! Even so CONE, LORD JESUS!! !